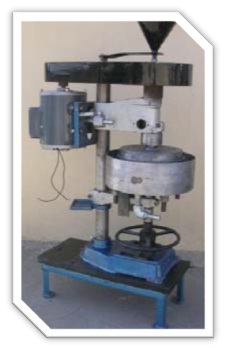 With our rich industry experience, we have established ourselves to offer a wide array of Jamb Peg Faceting Machines. The two housings contain two separate shafts driven by the same motor – but both these shafts can also be rotated in different directions with the help of an idler pulley. This pulley is adjustable and is also used in Tightening of the belt. 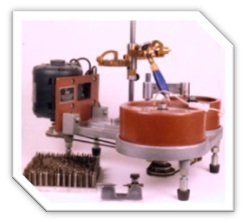 One housing is used for fixing the diamond coated grinding lap of 8″ Dia. 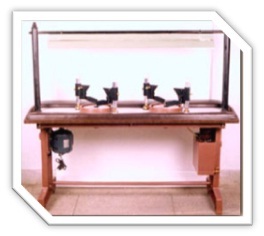 The machine base is made up of Cast Iron and is fixed with zinc coated steel legs with check nut to help in maintaining proper balance on any surface. ¼ h.p. 1440 r.p.m. 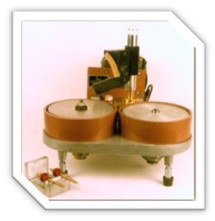 Single-phase 220 volts motor AC 50 cycle. This motor is fixed on a removable base plate. The two housings contain two separate shafts driven by the same motor – but both these shafts can also be rotated in different directions with the help of an idler pulley. This pulley is adjustable and is also used in Tightening of the belt. One housing is used for fixing the diamond coated grinding lap of 8″ dia. The other housing is for fixing the polishing lap of 6″- 8″ dia. This housing is adjustable to match the height of the polishing lap to that of the grinding lap. which helps in maintaining the angles and has a cheater adjustment for fine tuning the alignment. The dop sticks are fitted with the indexing attachment.